Is there a demo of the order form I can view? Yes, please see the Step by Step PowerPoint presentation. Yes, please contact Ambra Costner at 800-800-9975 to discuss training options. What are “templates” and how do I use them? Templates are cases that can reduce your data entry time. You can specify any file in your Casefile Manager to act as a template. When you choose to use a file as a template, a new file is created with all the template information retained. This is especially handy if you do loans that have a lot of the same information. If you do not wish to use a template, simply click on "Blank Template" and a new blank case will be created. What fees are considered prepaid finance charges? What is the "Current index value"? The "Current index value" is the published interest rate to which the interest rate on an Adjustable Rate Mortgage (ARM) is tied. Some commonly used indices include the 1 Year Treasury Bill, 6 Month LIBOR, and the 11th District Cost of Funds (COFI). Please see Federal Reserve Board's H.15 for the current rates. What is "Interest Calculations" and what should I chose? How do you accrue your interest? All Payments of interest shall be computed on the per annum basis of a year of 360 days and assume each period as having an equal number of days unless such calculation would result in a usurious rate, in which case interest shall be calculated on the per annum basis of a year of 365 or 366 days, as the case may be. All payments of interest shall be computed on the per annum basis of a year of 365 days (or 366, as the case may be) and for the actual number of days elapsed. Interest will be computed according to the true daily earnings method. The true daily earnings method is a method to compute an interest charge by applying a daily rate to the unpaid balance of the amount financed. The earned finance charge is computed by multiplying the daily rate by the number of days the actual principal balance is outstanding. The daily rate is the equivalent contract rate for a year with the number of days indicated in (1) above. What is the difference between the Amortization Methods? Standard Amortization (EQUAL PAYMENTS of Principal & Interest) - Amount applied to principal increases as payments to interest decrease over life of loan. Accelerated Amortization (EQUAL PRINCIPAL PAYMENTS plus Periodic Interest) - Payment decreases monthly: amount applied to principal remains constant but interest decreases as principal is reduced. Balloon - Interest Paid Periodically (Periodic Interest Only) - Interest only paid periodically - principal paid in single payment at maturity. Interest First (Interest Only Period followed by Standard Amortization) - Payment of interest only for given period followed by standard payment amortization remaining life of loan. What is the difference between the 2 FHA renewal calculation methods? According to HUD, lenders may use either methodology to determine the monthly premium; however, most lenders use FHA Connection method calculate for origination and underwriting purposes. Please beware that a number of investors will not accept this method. If you are looking for the HUD Single Family Servicing Method, please select 98-22 instead because they are the same. FHA Connection Method uses the starting balance amount to calculate the monthly renewals. Base loan amount x 0.5% / 12. This is an estimate only and is usually only slightly different than the actual precise calculation. ML 98-22 follows the strict requirements as published by HUD. The formula for calculating monthly mortgage insurance premium became effective May 1, 1998 (see Mortgagee Letter 98-22 Attachment). Sample calculations available here. How do I answer the questions on the Federal Box Disclosure screen? * Late charges subject to state regulation limits. How are the FHA MI premium rates determined? These changes are effective for FHA case numbers assigned on or after April 1, 2013 and June 3, 2013 as indicated. FHA is also continues to exercise its pre-existing statutory authority to add an additional 25 bps to mortgages with base loan amounts exceeding $625,500. This change is effective for case numbers assigned on or after April 1, 2013. The table below shows the duration of annual MIP by amortization term and LTV ratio for case numbers assigned on or after June 3, 2013. The Decrease to Up-Front Mortgage Insurance Premium on Certain Streamline Refinance Transactions for Case Numbers issued June 1, 2012 or later for loans ENDORSED BEFORE May 31, 2009 is maintained. Where can I get the addresses for the ECOA Notice? What are the rules regarding Service Providers and Affiliated Business Arrangements? Required Service Provider [24 CFR Sec 3500.7(e)(1)] includes service provider the borrower must use, is the lender’s choice and the borrower will pay a portion of the fee. i.e. If you have 5 or more service providers for a particular service, Lender may state “a provider has not been chosen but will be from a list maintained by lender. The name and exact cost will be provided on the HUD-I at settlement” then give a range of the cost of the service. Example $35 - $50. WHAT IS AN AFFILIATED BUSINESS ARRANGEMENT? How do I choose a loan plan? Select the Loan Program (who’s Note you want, i.e. Fannie Mae) from the Loan Plans pop up window, then select the appropriate Note according to the type of loan you are ordering. Contact Support@ppdocs.com to get your frequently used loan plans to always appear at the top of the list. Why am I seeing the same document in the Document Selection preview? It is an issue with your browser settings. Close the order form and then at the top of your browser window click the “Tools” menu. Then click “Internet Options” at the bottom. In the “Browsing history” section click on “Settings” and go to where it talks about checking for newer versions of stored pages and select “Every time I visit the webpage”. Finally, click “OK” at the bottom of both windows and go back into the order form and try to preview again. This should fix the problem permanently. Call Support at 800-800-9975 if you need further assistance. How do I get my fees to import from Calyx Point? In Calyx, be sure to click “Copy from Fees Worksheet” on Page 2 of the HUD-1 Settlement Statement screen. Having trouble importing from Encompass? Make sure the login/password you have stored in Encompass matches your PPDocs login and password exactly. To check for this, open a loan in Encompass and after you click “Services” then “Doc Preparation” you will see a “Password Manager” in the pop up window next to PPDocs, Inc. Click that and enter your PPDocs login and password and save. You should then be able to successfully Submit your data to us. Will I be charged for a redraw? There are never any additional charges for our unlimited redraws. How do I forward a document package to a borrower or servicer? Click on the document package you would like to send and in the Deliveries section click “New delivery. Send this package to..” and it will take you to the page where you can enter your and the recipient’s information, as well as add Password or Security Question protection. Where can I see sample packages? Please visit the Products page on our website and you will be able to view sample packages by state. Can we get custom forms added to your system? Yes. Send us a copy of the document in Word or PDF formats and tell us how and when you would like the document to be used. How do I upload a document to be added to the document package? How do I get borrower names, such as a Non-Borrowing Spouse, to print on certain documents only (such as Mortgage or Deed of Trust)? How do I hide order forms I never use? How can I hide loan plans I never use? After you login, click on “Setup” then “My Loan Plans”. Select the Loan Program you typically use and check the “Favorite” box next to the Note you most often use. The Favorites will not be shown at the top of your list in the order form with a star next to it. How to enter disbursements that are due more than once a year? Some jurisdictions require multiple payments per year. Payments due at odd intervals. For example, payments are due in March and December. In this case, you need to enter the escrow disbursement in 2 separate lines but select the same HUD line number. You must enter the amount of each payment. See illustration below. How do I enter the dates on a revised TIL or an amended GFE? You can update the Prepared Date of the TIL on the Loan Detail screen. The date on the TIL should always be the date the disclosure was prepared. If you have a changed circumstance and need to send an amended GFE, you should enter the date the GFE was amended. On the GFE Information screen, select ‘yes’ to the amended GFE question and then enter the Amended GFE Date. This date will appear as the "Date of GFE" instead of the Prepared Date. Please be sure to document all changed circumstances per RESPA. What happened to "non-borrower" in the signing drop down? It has been replaced by "MTG/DOT and TIL" to prevent confusion. What happened to the alternative status/conjunction for borrowers? It has been removed because it is no longer necessary to use in completing the borrower vesting for the Deed of Trust. Please complete the "Vesting Tool" screen that comes after the borrower screen to see what the vesting will look like. What is the "Vesting Tool" screen and where is the "Status/Conjunction" screen? The "Vesting Tool" screen has replaced the "Status/Conjunction Information" screen in our efforts to simplify the vesting on the Deed of Trust. On that screen, you will see any borrower that is listed as signing either "All Documents" or signing "MTG/DOT and TIL" and when you complete the statuses, you will see the vesting preview below. If you wish to type both the conjunction and the status, feel free to do so. Below the borrowers is a preview box of what the language will be on the Deed of Trust first page that defines the undersigned parties. You can make changes in this box. The changes you make will save with the loan, and the edited version will print on the top of the Deed of Trust. However, if you make changes to any borrower's name or signing, it will recalculate what the text should be. What happened to the beneficiary field regarding the trust information? What are the hud line credits for? 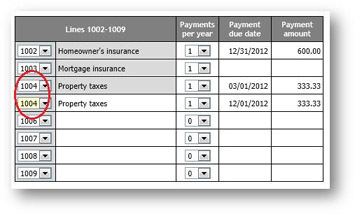 801, 1101, and 802 Charges now have a new column for Credit Amount and a new column for Credit By. This is intended to assist in the itemization of the credits listed in the 200 series. These changes allow for a lender, seller, or third party to credit a portion of specific fees in order reduce prepaid finances charges or points and fees affecting our various high cost tests. You must enter a number that is less than or equal to the borrower amount. If you enter a fee that is greater than the borrower amount, it will be changed to reflect the maximum borrower amount when you hit the "OK" button. How broker comp should be reflected on the GFE and HUD-1? Any compensation paid by the creditor to the broker, including any payments based on the loan amount or loan terms, or any flat rate payments, must be shown as a “credit for the interest rate chosen” in Block 2 of the GFE and Line 802 of the HUD-1. The sum of the amounts shown in Blocks 1 & 2 of the GFE, and Lines 801 & 802 of the HUD-1, is shown as either a positive or negative number (as applicable) in Block 3 of the GFE and Line 803 of the HUD-1. Finance Charge – Reg. Z, Section 1026.4(a)(3) and the official staff commentary states that broker comp paid directly by the borrower is a finance charge. Compensation paid to the broker by a creditor, however, is not a separate component of the finance charge (although it may be reflected in the finance charge if the broker comp is funded through amounts paid by the consumer, such as points and interest). Accordingly, broker comp. from a creditor to the broker is not a finance charge (even though it may be reflected in the finance charge through points or interest paid by the borrower). Broker comp. paid directly by the borrower is a finance charge. HOEPA & QM Points and Fees – Reg. Z, Section 1026.32 stats that all LO comp paid directly or indirectly by a consumer or creditor is included in the points and fees. It can be included either as a finance charge or as LO comp, depending on the source of the broker payment. All broker comp paid directly or indirectly by the borrower or the creditor must be included in points and fees. Either it is included in points and fees as a finance charge under 1026.32(b)(1)(i) (if paid directly by the borrower to the broker), or it is included in the points and fees as LO comp under 1026.43(b)(1)(ii) (if paid by the creditor to the broker). Broker comp is counted once for inclusion into points and fees (for example, one $3,000 broker fee is not be included in the points and fees two times, once as a finance charge and a second time as LO comp. It is counted once as $3,000 towards the points and fees limit). Why should credits be itemized? Since not all lender-paid or seller-paid fees are excluded from QM and HOEPA points and fees, it is important to itemize those fees on the HUD-1 so it is clear exactly which fees were paid by the lender or seller. If they are lumped together, then it creates ambiguity about whether the appropriate lender or seller-paid fees were excluded from points and fees. We allow exclusions if and only if credits are itemized. We still allow lump credits on the HUD-1, but those lumped credits will not reduce the points and fees. What does it mean for my MI premium to be refundable on a pro-rata basis? Refundable on a pro-rata basis means that there is a prorated refund of the portion of the current annual insurance premium previously paid by the consumer; calculated from the date a loan is paid in full or voluntarily terminated to the end of the year/cycle the premium is paid through. The regs (§ 220.806) say: Upon termination of loan insurance contract by a payment in full or by a voluntary termination, the Commissioner shall refund to the lender for the account of the borrower an amount equal to the pro rata portion of the current annual loan insurance premium theretofore paid which is applicable to the portion of the year subsequent to the date of the prepayment or the effective date of the voluntary termination of the contract of insurance. What is "Collaborate with Settlement Agent"? With Bank of America and Wells Fargo announcing that they will produce the Closing Disclosure, most banks will follow in their footsteps. How will you get the Settlement Agents data? Emails that get buried in their inbox? Faxes that you can't read clearly? How about an integrated solution that allows you to collaborate with settlement agents in real time? 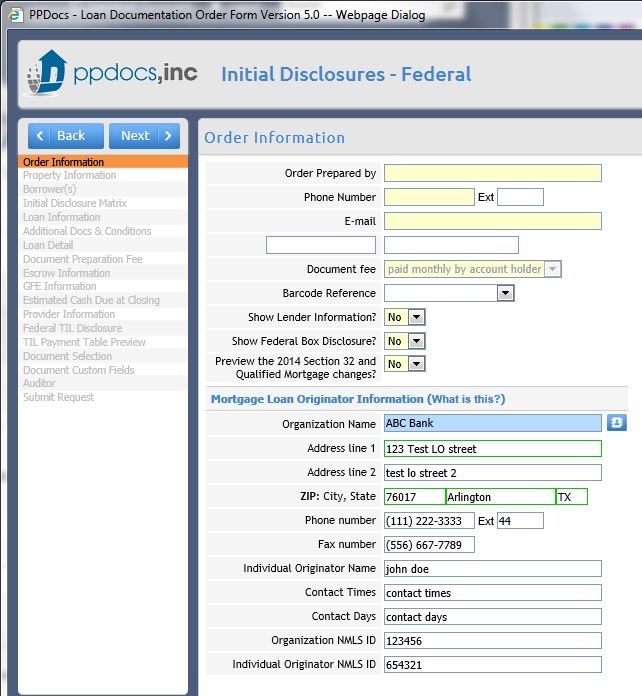 PPDocs, inc. has developed a solution that allows the Lenders to send an invitation to any settlement agent to input their fees. Where can I look up State Numbers for Title Companies and the Closers? You can find resources to look up state numbers for a variety of states at this link. The Uniform Closing Dataset (UCD) is a common industry dataset that supports the Consumer Financial Protection Bureau’s (CFPB) Closing Disclosure which is part of the Uniform Mortgage Data Program (UMDP). It is an upcoming requirement of Fannie Mae and Freddie Mac at the direction of their regulator, the Federal Housing Finance Agency. The GSEs will require a UCD XML file for all loans having a note date on or after Sept. 25, 2017. Most investors, whether planning to immediately deliver to the GSEs or aggregating for a later loan delivery, will require lender to submit the UCD file to both Fannie and Freddie and receive the UCD Findings Reports from both GSEs as a condition of their loan approval to ensure the upload was successful to both GSEs and the Casefile ID is correct for the loan. For more information, please see this link for more information. What is the Unique Loan Identifier Number? The unique loan identification number for TRID disclosure purposes is not specifically required to be related to the lender loan number, as a creditor may not actually know what that loan number might be when issuing an initial LE. The creditor is allowed to assign a unique loan identification number to the transaction for TRID purpose and then the creditor is required to use that same unique number on all subsequently issued LEs and CDs to identify that it is the same transaction. Section 1026.37(a)(12) requires that the creditor disclose a loan identification number that may be used by the creditor, consumer, and other parties to identify the transaction, labeled as “Loan ID # .” The loan identification number is determined by the creditor, which number may contain any alphanumeric characters. Because the number must allow for the identification of the particular credit transaction under § 1026.37(a)(12), a creditor must use a unique loan identification number, i.e., the creditor may not use the same loan identification number for different, but related, loan transactions (such as different loans to the same borrower). Where a creditor issues a revised Loan Estimate for a transaction, the loan identification number must be sufficient to enable identification of the transaction pursuant to § 1026.37(a)(12). After you login, click on “My Account” then “My Profiles” under Settings. You can add a new profile or click on an existing Profile, clone it, then update it with your information. After you login, click on “My Account” then “Change Password” under Settings. Enter current password and new password, then click “update”. Locked out from too many failed login attempts? Close out of ALL internet windows you have open, then re-launch PPDocs.com. This will give you 3 new attempts. If you are still unable to login, contact us. How do I get a copy of a file that is under somenone else's login? If you have forgotten your password, you may reset it by clicking here. You will receive an email with instructions on how to reset it. If you cannot access your email or have other questions, contact us. What is the difference between Express and Full Service loan documentation? Full Service will be submitted to PPDocs, Inc. to perform quality control of data based on the information entered on the order form and provided via fax. We will provide the required documents as well as review title commitment and survey. Express Service products will not be reviewed, nor will any quality control be done by PPDocs, Inc. We will suggest to you a list of possible documents for your transaction. You may modify the document selection as needed. You may request multiple redraws as needed. There are no redraw fees. What does it cost for express or full service loan documentation? There is no contract to sign and no minimum order requirement. Just take a few minutes to get registered and start ordering. Where can I get a list of counties that accept eRecording? Click here for the list of counties that accept eRecording. And we’re continually adding more counties, so be sure to check back periodically. What is the cost for eRecording services? After the document has been successfully recorded with the County, you will receive an invoice for the County’s recording fees plus a $10 Convenience Charge. There are no charges if the document gets rejected. Is there advance setup required for eRecording? What fulfillment services to you offer? Our fulfillment services include, but are not limited to: Pre-Closing HUD-1 Review, Funds Request, Funding Approval, Closed Loan Package Audit and Delivery, Credit Package Delivery, Investor Purchase, and Final Document Delivery. Can I order just one or two of the fulfillment services available? We will customize our fulfillment services to fit your needs. Whether it is a HUD-1 Review or Investor Delivery, we only charge you for the services that you use. Can I order fulfillment services on a loan by loan basis? There is no minimum amount of loans required to use our services. You can choose to utilize fulfillment on just one loan or on multiple loans. How do I get setup for fullfillment services? As we ramp up our TRID production, we consolidated all TRID related resources and tools to a single location on our website to make it easier to find. Why should lenders show just one provider per service on the written list when they allow the consumer to shop? The regulation requires the lender to provide a written list with at least 1 provider listed for each service the consumer may shop for. The regulation does not require more than 1 service provider on the written list per settlement service. If the consumer selects a provider from the list, the fee for that service falls into the 10% tolerance bucket. If the consumer is allowed to shop and does not select from the written list, however, then the fee is not subject to tolerance as long as it is not being paid to the creditor, broker, or an affiliate of either. Accordingly, if you show more than 1 provider per service on the list, there is greater chance that the consumer will select from the list and cause the fee to fall into the 10% tolerance bucket. What is RESPA and Regulation X coverage? Lender and/or loan is "federally related." Includes Lenders with federally insured deposits and/or regulated in any way by the federal government and any loan sold to FNMA or FHLMC. Does not normally cover seller financing. The above regulation coverage definition is a general summary. Please call PPDocs, Inc. at 1-800-800-9975 to discuss specific factual circumstance and applicable coverage or exemptions. What is TILA and Regulation Z coverage? How do I count the days under RESPA? GFE 10 day requirement: Day 1 is the day the GFE is given or mailed to the borrower. You must be open for business on Saturday to count that as one of the 10 days. Do not count Sunday and Federal Holidays. A GFE must be revised within 3 days of learning there is a changed circumstance. The Closing date for a revised GFE must be 3 days from the date the Disclosure is mailed. If the GFE is given to the borrower directly, there is no delay in closing. How do I count the days under TILA/MDIA? General Definition of Business Day: is any day on which the creditor's offices are open to conduct substantially all of its business functions. The Precise Definition of Business Day: The precise definition of business day means "all calendar days except Sundays and legal holidays (New Years Day 1/1, Martin Luther King Jr.'s Birthday, Washington's Birthday, Memorial Day, Independence Day 7/4, Labor Day, Columbus Day, Veterans Day 11/11, Thanksgiving Day and Christmas Day 12/25). Note: The following examples were taken from the Federal Register. As a result, all dates referenced in such examples will refer to the year 2009. The First 3 Day Waiting Period (Mailing of the Initial TIL): The lender must provide the initial TIL disclosure no later than 3 business days (using the general definition of business day) after application is received and at least 7 days before consummation. Note: The timeframe to provide or mail the initial TIL disclosure has not changed. The Disclosure time period begins on the business day following receipt of the consumer’s application. The Second 3 Day Waiting Period: When is the Consumer Deemed to have Received the Disclosure for purposes of Reg Z? Receipt of Disclosures: When the disclosure is mailed, the consumer is deemed to have received the initial TIL disclosure 3 business days (the precise definition is used here) after mailing. When Can a Fee be Collected? And, no fee may be imposed on a consumer before the consumer receives the initial TIL disclosure except for a credit report fee that is bona fide and reasonable (for counting purposes. Fees other than the credit report fee may not be collected until after midnight on the third business day after receipt of the disclosure). Use the precise definition of Business Day here. Consummation may occur on or after the seventh business day after the delivery or mailing of these disclosures. Example of 7 day Waiting Period without Corrected Disclosures:if a creditor delivers the early disclosures to the consumer in person or places them in the mail on Monday, June 1, 2009, consummation may occur on or after Tuesday, June 9, 2009, the seventh business day following delivery or mailing of the early disclosures. If the annual percentage rate provided in the good faith estimates changes beyond a specified tolerance for accuracy, creditors must provide corrected disclosures, which the consumer must receive on or before the third business day before consummation of the transaction. The final rule allows consumers to expedite consummation to meet a bona fide personal financial emergency. Reg. Z, 12 C.F.R. §1026.19 Certain mortgage and variable-rate transactions.Waiting periods for early disclosures and corrected disclosures. (i) The creditor shall deliver or place in the mail the good faith estimates not later than the seventh business day before consummation of the transaction. Reg. Z, 12 C.F.R. §1026.19 Certain mortgage and variable-rate transactions.If the annual percentage rate disclosed under paragraph (a)(1)(i) of this section becomes inaccurate, as defined in § 1026.22, the creditor shall provide corrected disclosures with all changed terms. The consumer must receive the corrected disclosures no later than three business days before consummation If the corrected disclosures are mailed to the consumer or delivered to the consumer by means other than delivery in person, the consumer is deemed to have received the corrected disclosures three business days after they are mailed or delivered. Reg. Z, 12 C.F.R. §1026.19(a)(3) If the consumer determines that the extension of credit is needed to meet a bona fide personal financial emergency, the consumer may modify or waive the seven-business-day waiting period or the three-business-day waiting period required by paragraph (a)(2) of this section, after receiving the disclosures required by § 1026.18. To modify or waive a waiting period, the consumer shall give the creditor a dated written statement that describes the emergency, specifically modifies or waives the waiting period, and bears the signature of all the consumers who are primarily liable on the legal obligation. Printed forms for this purpose are prohibited. The Time Period Before Consummation: The customer must receive a final corrected disclosure at least 3 business days before consummation. The precise definition of business day is used here. For example, assume a creditor delivers the early disclosures to the consumer in person or places them in the mail on Monday, June 1, 2009 and the creditor then delivers corrected disclosures in person to the consumer on Wednesday, June 3, 2009. Although Saturday, June 6 is the third business day after the consumer received the corrected disclosures, consummation may not occur before Tuesday, June 9, 2009 the seventh business day following delivery or mailing of the early disclosure. In PersonIf the creditor delivers the corrected disclosures to the consumer in person, consummation may occur any time on the third business day following delivery. If the creditor provides the corrected disclosures by mail, the consumer is considered to have received them three business days after they are placed in the mail, for purposes of determining when the three-business-day waiting period required under Sec. 1026.19(a)(2)(ii) begins . Creditors that use electronic mail or a courier other than the postal service may also follow this approach. Basis for annual percentage rate comparison.To determine whether a creditor must make corrected disclosures under Sec. 1026.22, a creditor compares (a) what the annual percentage rate will be at consummation to (b) the annual percentage rate stated in the most recent disclosures the creditor made to the consumer. On Thursday, June 11, 2009 the annual percentage rate will be 7.25%, which exceeds the most recently disclosed annual percentage rate by less than the applicable tolerance. The creditor is not required to make additional corrected disclosures or wait an additional three business days under Sec. 1026.19(a)(2). On Thursday, June 11, 2009 the annual percentage rate will be 7.30%, which exceeds the most recently disclosed annual percentage rate by more than the applicable tolerance. The creditor must make corrected disclosures such that the consumer receives them on or before Monday, June 8. What are the common waiting periods? Please see this summary chart to determine how to calculate various dates. It has information regarding Saturdays, holidays, and what is considered to be a holiday. Can I waive any of the required days? When can I collect the appraisal fee? After the borrower has received the TIL and gives notice of intent to continue. What is the exemption requirement from establishing an escrow account on higher cost mortgage (Section 35)? (A) During the preceding calendar year, you (Lender) extended more than 50 percent of your total covered transactions secured by a first lien, on properties that are located in counties designated either “rural” or “underserved” by the CFPB. (C) As of the end of the preceding calendar year, you (Lender) had total assets of less than $2,000,000,000; this asset threshold shall adjust automatically each year, based on the year-to- year change in the average of the Consumer Price Index for Urban Wage Earners and Clerical Workers, not seasonally adjusted, for each 12-month period ending in November, with rounding to the nearest million dollars. What is a mortgage loan originator? (i)Takes a residential mortgage loan application; and. (ii)Offers or negotiates terms of a residential mortgage loan for compensation or gain. The order form now asks for the mortgage loan originator (usually the lender), their NMLSR ID, the individual loan originator (usually the loan officer), and their NMLSR ID. What should be entered in the loan originator identifier data field if a loan originator has received an exemption from obtaining or is not required to obtain a loan originator identifier? Fannie Mae recognizes that in limited instances a loan originator may be exempt from obtaining or is not required to obtain a loan originator identifier through the NMLS. If the loan originator is exempt from obtaining or is not required to obtain an identifier, then the lender should populate the data field with a value of "1000". Delaware, and Missouri are not currently requiring loan origination companies to obtain identifiers through the NMLS. What should be entered in the loan origination company identifier field (Sort ID 627) if the company is located in one of these states? If a state regulated loan origination company does not have a NMLS ID because they are located in Delaware, or Missouri, the Loan Originator Company Identifier should be populated with 1001 for Delaware and Missouri should use 1003. What is a Bona Fide discount point? an amount equal to 1 percent of the loan amount paid by the consumer that reduces the interest rate or time-price differential applicable to the transaction based on a calculation that is consistent with established industry practices for determining the amount of reduction in the interest rate or time-price differential appropriate for the amount of discount points paid by the consumer. Please beware that some investors will include (not exclude) the entire Discount fee in the points and fees test. If so, you should not check the box. An affiliate is any company that controls, is controlled by, or is under common control with, your company. This generally means that your affiliates are your parent company, your subsidiaries, and your sister companies. 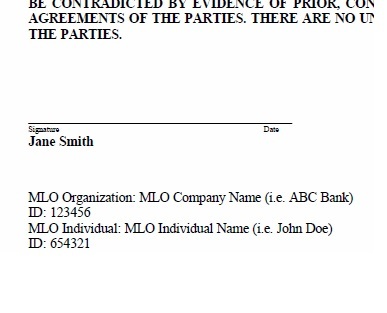 For example, if your organization is a bank owned by a bank holding company that also owns another bank, both the bank holding company and the other bank are your bank’s affiliates. How does my construction term affect my qualified mortgage? We recommend that the initial construction period be one year or less if you want the permanent loan to be a QM. Make sure the construction period is not “one year and 1 day”…e.g. funding date of Feb 6, 2014 needs to have completion date on or before Feb 5, 2015. The “odd days” can be picked up as per diem in front of the permanent phase of the loan. Construction term may be renewed multiple times as long as it is not renewed for more than one year at a time. What is a temporary or bridge loan? 1. Renewable temporary or "bridge" loan. Under § 1026.43(a)(3)(ii), a temporary or "bridge" loan with a term of 12 months or less is exempt from § 1026.43(c) through (f). Examples of such a loan are a loan to finance the purchase of a new dwelling where the consumer plans to sell a current dwelling within 12 months and a loan to finance the initial construction of a dwelling. Where a temporary or "bridge loan" is renewable, the loan term does not include any additional period of time that could result from a renewal provision provided that any renewal possible under the loan contract is for one year or less. For example, if a construction loan has an initial loan term of 12 months but is renewable for another 12-month loan term, the loan is exempt from § 1026.43(c) through (f) because the initial loan term is 12 months. The language of the rule and official staff commentary could leave the impression that the only type of “temporary” loans that qualify for the exemption are a bridge or interim construction loan. It is unclear what other types of loans with terms of 12 months or less, if any, would be considered “temporary” loans under the rule. One industry trade association commented on the wording of the temporary financing exemption, suggesting that the inclusion of the two examples, bridge loans and construction loans, would create uncertainty as to whether the exemption would apply to temporary financing of other types. However, the Bureau believes further clarification is not required because the exemption applies to any temporary loan with a term of 12 months or less, and the examples are merely illustrative. The Bureau is aware of and provides clarifying examples of certain common loan products that are temporary or “bridge” loans. The commenter did not note other common types of temporary loan products. The Bureau further believes that the rule permits other types of temporary financing as long as the loan satisfies the requirements of the exemption. The preamble is ambiguous because the CFPB does not clarify what “other types of temporary financing” are eligible for the temporary or bridge loan exemption from the ATR/QM rule. Accordingly, it is not clear whether every type of short-term loan that has a term of 12 months or less is exempt from the ATR/QM rule under the temporary or bridge loan exemption. If you are making a short-term loan with a term of 12 months or less that is for purposes other than a bridge or interim construction loan, please consider that the loan may be subject to the requirements of the ATR rule under Reg. Z, Section 43. What is an "Original Creditor"? What are the new Joint Agency Flood exceptions, or exemptions starting January 1, 2016? All supervised institutions, which do not meet Joint Agency Flood exemptions, or exceptions are required to escrow flood insurance premiums for the term of the loan, as of January 1, 2016. Exemptions: State-owned property covered under a policy of self-insurance; loans securing property for $5,000 or less, with a term of 12 months or less; or, any structure that is part of a residential property, but detached from the primary residential structure and does not serve as a residence. Transaction Exceptions: business, agricultural or commercial; subordinate liens, where first lien holds flood escrow; flood that meets requirements is provided by HOA, condo association, or co-op; a home equity line of credit; a non-performing loan; or, a loan having a term of 12 months or less. Small Lender Exception: Total assets of less than $1 billion as of December 31st of either of two prior calendar years; and, on or before July 6, 2012, was not required by Federal or State Law to escrow for residential improved real estate, or mobile homes; and, did not have a policy of consistently requiring escrow accounts on residential improved real estate or mobile homes. Why is the date that the closing costs expire no longer required on some files? Once the consumer indicates an intent to proceed within the time specified by the creditor under § 1026.37(a)(13)(ii), the date and time at which estimated closing costs expire are left blank on any subsequent revised disclosures. The creditor may extend the period of availability to expire beyond the time disclosed under § 1026.37(a)(13)(ii). If the consumer indicates an intent to proceed within that longer time period, the date and time at which estimated closing costs expire are left blank on subsequent revised disclosures, if any. How and when do I indicate that a property has an estimated property value? In transactions where there is no seller, such as in a refinancing, creditor is required to disclose the estimated value of the property based on the best information reasonably available to the creditor at the time the disclosure is provided to the consumer, which may include, at the creditor’s option, the estimated value of the improvements to be made on the property in transactions involving construction. The creditor may use the estimate provided by the consumer at application unless it has performed its own estimate of the property value by the time the disclosure is provided to the consumer, in which case the creditor must use its own estimate. If the creditor has obtained any appraisals or valuations of the property for the application at the time the disclosure is issued to the consumer, the value determined by the appraisal or valuation to be used during underwriting for the application is disclosed as the estimated property value. What is the last disclosed TRID Total of Payments? The disclosed Total of Payments is the amount disclosed on the last Closing Disclosure received by the consumer. Section 1026.38(o)(1) requires that the amount disclosed as total of payments not be understated by more than $100. What is the last disclosed Finance Charge? The disclosed finance charge is the finance charge on the last Closing Disclosure received by the consumer. Section 1026.18(d) requires that the amount disclosed as finance charge not be understated by more than $100. Why is the escrow payment in the Estimated Taxes, Insurance & Assessments section disclosed as monthly when my P&I payments aren’t? The amount to be shown in this section is to be “expressed as a monthly amount” per Reg. Z § 1026.37(c)(4)(ii). As this does not reference a “monthly payment amount”, this will not change with the payment frequency.